We preserve your precious memories by digitizing your treasured photos, movie film, video and audio recordings, negatives and slides. We offer a complete range of services as related to photography, photo, video and audio archiving, photo printing, and photo restoration. Not in our area? Feel free to call and discuss your project. We may pay shipping of your items both ways! For more than 30 years, Photo Solutions has partnered with CHADON Photographers, serving clients not only in Bloomington, Indiana, but throughout the Midwest. With a robust internet presence, our client base has spread far and wide. We have several resourceful and experienced technicians who take great pride in helping clients solve their photo related technical problems as well as achieve their personal imaging objectives. This personal service and attention to detail are what many clients return for time and again. Explore the menu above to see how we can help you with any of your photo, audio or video needs. Do you have a project that doesn’t seem to fit in any of the categories above or is just slightly different than what we have here on our website? Feel free to call us, email us or stop by our store to discuss your needs and what you would like to have done! Do you buy, sell or repair equipment or products? No, we do not buy, sell or repair equipment or products. We are a digital lab. We are open 9:00 am to 6:00 pm, Monday thru Friday. We do not close for lunch. We are not open on the weekends. 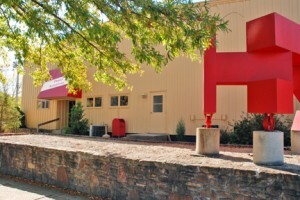 We are located at 115 N Madison St. in Bloomington, Indiana. We are 2 blocks west of the courthouse between 5th and 6th streets, caddie corner from Bloomingfood’s. 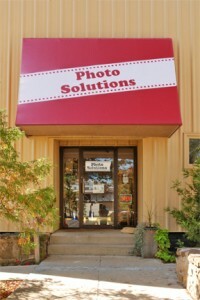 We are a large metal building with a red canopy that reads “Photo Solutions”. You can, but an appointment is not necessary. Walk-ins are always welcome. Does my media or work leave your location? No, all work is done in house by our trained technicians. We never send any of your pictures, film, slides, movies or anything else you leave with us to another location. This insures that all of your memories are safe and secure at all times. How long until my finished product is done? This depends on the complexity of the work that is to be done and our current backlog of jobs. When you drop off your order, we will give you an estimate on how long it will take.